A few years ago I had a birthday lunch at St John. As I was tucking into my rook pie I couldn't help but glance admiringly at a neighbouring table where two businessmen were tucking into a bowl of gulls eggs accompanied by an enormous bottle of Ruinart. No matter how good my rook, I wanted them eggs. Last weekend I finally tried some. To celebrate my being offered a new job, Ben and Antonia took me to Mark Hix's new eponymous restaurant. It's just around the corner from St John and offers, as you would expect from the man who ran the Rivington, British seasonal fare. The main business of the restaurant is chops and oysters. The gulls eggs were a whopping five pounds each. Danger money for abseiling down through a scene from a Hitchcock film I guess. They came with a little mayonnaise and a pile of celery salt which the waitress proudly announced they'd made themselves. The subtle flavour of the eggs was perhaps masked by the powerful celery salt but the fine texture and richness of the still soft yolk were excellent. 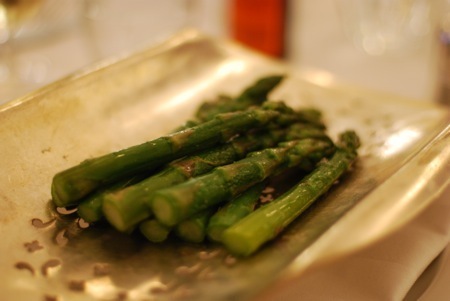 Asparagus featured strongly on the menu and as a starter I had a soft boiled duck egg with spears as soldiers. The egg was just right for dipping and the asparagus was fresh and flavourful. I'd partly ordered this because I'd seen Hugh Fearnley-Whittingstall do rather a good version of this on his new tv programme, though with added vinegar to create a sort of do it yourself hollandaise. Hix should do this too. Ben murmured appreciatively about his rabbit brawn and Antonia's Welsh rabbit (rarebit) looked less substantial (though more expensive) than the St John offering. The knockout dish of the evening was a buttermilk drop scone with East End honey ice cream and honeycomb. Cockney bees up? The drop scone is like a small American pancake and was a perfect base for the rich ice cream. Delicious. In atmosphere and design, it's somewhere in between St John and the Rivington, which is exactly as you might expect, given the food. Busy and buzzy on a Friday night, Ken Stott arrived with a party as we left, bizarrely finding the restaurant's street sealed with barriers and bouncers at each end. A good restaurant if most of your party wants to go to St John, but someone awkwardly insists on steak. Congrats on the new job, Howard! Hope that there are a few more celebratory meals before you leave! Oh, interesting! Hopefully, these are just teething problems that will iron out. Bouncers though? ?